Neuroimmunol Neuroinflammation 2018;5:9.10.20517/2347-8659.2018.03© The Author(s) 2018. 1Department of Paediatrics, Chi-Mei Medical Center, Tainan 710, Taiwan. 2Research Department, Chi-Mei Medical Center, Tainan 710, Taiwan. 3Department of Paediatrics, Kaohsiung Medical University, Kaohsiung 800, Taiwan. 4Department of Physical Medicine and Rehabilitation, Chi-Mei Medical Center, Tainan 710, Taiwan. 5Department of Recreation and Health-Care Management & Institute of Recreation Industry Management, Chia Nan University of Pharmacy, Tainan 711, Taiwan. 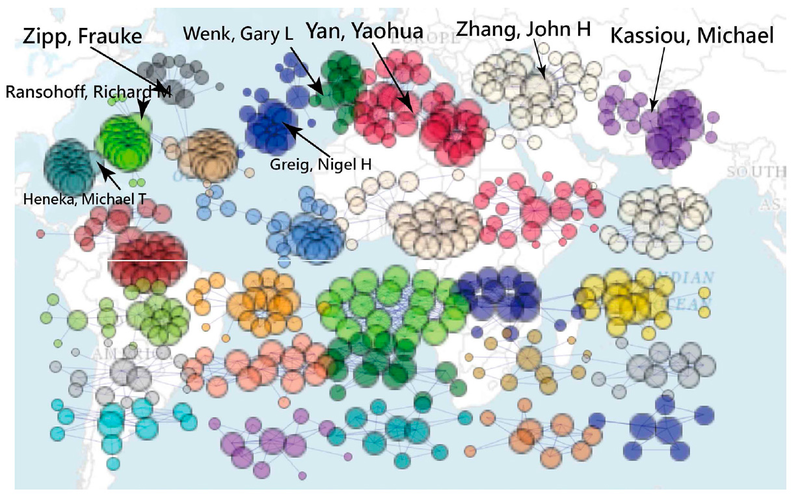 Aim: To apply cluster coefficient (CC) to the pattern of international author collaborations in neuroimmunology and neuroinflammation using data from Medline and to visualize results using Google maps and social network analysis (SNA). Methods: Selecting 2799 abstracts, author names, countries, and keywords on January 22, 2018 from Medline based on keyword neuroimmunology (or neuroinflammation) within the article title since 1982, we reported following features: (1) nation distribution for the 1st author’s nationality; (2) eminent journals and authors in the field of neuroimmunology and neuroinflammation; (3) notable keywords defined by authors representing both neuroimmunology and neuroinflammation; and (4) CCs in networks. We programmed Microsoft Excel VBA routines to extract data from Medline and used Google Maps and SNA Pajek software to display graphical representations with an easy-to-read feature for readers. Results: We found that: (1) the most number of papers in neuroimmunology and neuroinflammation are from the USA (902, 32.23%) and China (363, 12.97%); (2) the productive journals and authors in neuroimmunology and neuroinflammation are J Neuroinflammation and PLoS One, and Michael T. Heneka (Germany) and Richard M. Ransohoff (USA); (3) the most linked keywords are interleukin (IL), IL-1beta, and blood brain barrier; (4) author networks present higher CC than those nation networks. Conclusion: SNA provides wide and deep insight into the relationships among nations in co-author collaboration. The results can help readers in future submission to a journal in neuroimmunology and neuroinflammation. Neuroimmunology is a field combining neuroscience, the study of the nervous system, and immunology in a review of the immune system. Neuroimmunologists seek to better understand the interactions of these two complex systems during the development of homeostasis and response to injuries. A long-term goal is to further develop our understanding of the pathology of certain neurological diseases. Similarly, neuroinflammation is inflammation of the nervous tissue. It is initiated in response to a variety of cause such as infection, traumatic brain injury, toxic metabolites, or autoimmunity. The central nervous system is typically an immunologically privileged site because peripheral immune cells are blocked by the blood-brain barrier[3,4]. However, the issues including author collaboration and keyword defined by authors are still unclear. By January 22, 2018, more than 18,282 papers have appeared on PubMed when searching with the keyword (neuroimmunology OR neuroinflammation) and 2885 in the paper title only including the keyword (neuroimmunology [Title] OR neuroinflammation [Title]) since 1982. The issue of which nations dominate the papers published in neuroimmunology and neuroinflammation intrigues us to investigate which keywords are most frequently seen in those articles in the past decades. Big data is a concept that has evolved from the modern trend of scientism. Many data scientists develop ways to discover new knowledge from the vast quantities of increasingly available information. Even an apocryphal story was often told to explain the concept of co-occurrence between beer and diaper sales[6-8], the way of finding both beer and diaper sales had a strong correlation on Friday is unclear in the literature. All possible pairs of observed goods or services are worth studying the association, which is similar to the keywords and authors in journal papers. Fortunately, social network analysis (SNA)[9-11] can analyze big data for us to investigate the association of any pairs of goods or services in a network. Authorship collaboration using SNA is an example regarding co-authors in recent years because co-authors among researchers form is a type of social network. Whether the authoring network earns a higher centrality measure (or density) than the national system is required to explore. We are thus interested in using SNA to explore the features in neuroimmunology and neuroinflammation from published papers we observed in Medline library. Google Maps provide an overall view of geospatial visualization with coordinates of latitude and longitude on a map[12,13]. However, a few appeared in Medline library in search of keyword “google map [Title]” on November 22, 2017. Many papers[9-11] have studied on co-author collaboration in academics, however, none display results with Google Maps and SNA. Our aims are to apply the clustering coefficient to the pattern of international author collaboration in neuroimmunology and neuroinflammation on the following topics: (1) nation distribution; (2) the most eminent journals and authors in neuroimmunology and neuroinflammation; (3) the recent research domains defined by authors; and (4) the cluster coefficients (CCs) in different networks. We programed Microsoft Excel VBA modules to extract abstracts and their corresponding co-author names as well as author-defined keywords for each article on January 22, 2018, from Medline since 1982. Only those abstracts published by the keyword (neuroimmunology [Title] OR neuroinflammation [Title]) were included. Others like those labeled with Published Erratum, Editorial or without author nation name were excluded from this study. A total of 2885 eligible abstracts were obtained from the Medline. Before visualizing our results using SNA, we organized data in compliance with the format and guidelines defined by Pajek software. Microsoft Excel VBA was used to deal with data fitting to the SNA requirement. Two tables (i.e. columns for publication years and rows for the 1st author nations or journals) were made for presenting the distribution in nation (of journal) for the domain of neuroimmunology and neuroinflammation. The bigger bubble means, the more number of the nodes (i.e. nations, or keywords in this study). The wider line indicates, the stronger relations between the 2 nodes. Community clusters are filled with different colors in bubbles. The most eminent authors were calculated from the Medline library since 1982. If keywords represent the research domain, the stronger relations between the two keywords can be highlighted and linked by SNA. Like the concept of co-occurrence about beer and diaper sales during weekend. The presentation for the bubble and line is similar to the previous section in the interpretation. Keywords defined by the authors were applied to represent the domains in the current study. Google Maps and SNA Pajek software were used to display and visualized representations for eminent authors and keywords in relation with neuroimmunology and neuroinflammation. Author-made Excel VBA modules were applied to organize the data. CC represents the density of a network and a significant level (> 1.96) is defined by t-value as the formula [= CC × [(n-1)/(1-CC2)]1/2], where n = the number of nodes in a network. In contrast, E-I index is defined by the formula, where EL = the number of external friendship links and IL = the number of internal friendship links. The negative E-I index means a coherence cluster in existence. Similarly, the higher CC indicates many members are members’ friends linked to others. Density denotes as the ratio of the linkage members over all possible members. A total of 2799 eligible papers with complete author nations based on journal article since 1982 are in Table 1. We can see that the most number of articles are from the countries of USA (902, 32.23%) and China (363, 12.97%). The trend in the number of publications with authorship is present in the column of growth in Table 1. All nations but the Netherlands and Israel showed a positively increase. The diagram in Figure 1 displays author collaboration among nations. Overall, the highest production in countries are from the USA, China, and Europe [Figure 1]. Any collaborated with others are shown with a blue line. Interested authors are recommended to click the bubble of interest to see details on a website at the reference. The most prominent journals and authors with the most number of papers in neuroimmunology and neuroinflammation are J Neuroinflammation and PLoS One as well as Michael T. Heneka (Germany) and Richard M. Ransohoff (USA) [Table 2 and Figure 2]. The link on website appears at http://www.healthup.org.tw/gps/Neuroimmunologyauthor.htm. The most linked keywords are interleukin (IL), IL-1beta, and blood-brain barrier [Figure 3]. We can see that the keywords consisting of many clusters with different cluster coefficients. Each cluster has its cluster coefficient representing the density of a network. We found that author clusters earn higher CC than have nation clusters. Cluster coefficient has a significant effect in comparison with a considerable t-value (> 2.0), indicating author network with more significance than those of the nations [Table 3]. *Denotes significance when t-value greater than 2.0. CC: cluster coefficient. Many previous types of research[9-11] have investigated co-author collaboration using SNA. The results (the most number of articles from the USA and Europe) are similar to the findings that dominant nations in science come from the USA and Europe[21-23], but China recently has an increasing trend in publication. Referring to the apocryphal story told to discover the co-occurrence about beer and diaper sales[6-8], we presented a novel method incorporating SNA with Google Maps to explore the data. It can be seen that visual representations offered to the readers are rare in literature. Traditionally, it is hard to observe the association of two or more symptoms or entities together that appeared in a network at that moment. Journal authorship collaboration compared with each other using Google Maps is illustrated in this study. We can see that many links are connecting two nations which indicate a collaboration pattern in paper publication similar to the previous study. Hence, it is easy to observe the phenomena of international author collaboration in neuroimmunology and neuroinflammation, which is inconsistent with the earlier reviews that investigated scientific collaboration of Iranian Psychology and Psychiatry Researchers[23,24]. There are 319 papers with the keyword of SNA when searching Medline on December 21, 2017. There were only two papers[25,26] that incorporated medical subject heading into SNA to release relevant knowledge to readers. However, only a few[27,28] include Google Maps link like we used in our current study. The CCs we illustrated at references[17-20] are called overall CCs. The CCs in figures are 1.0, 0.61, and 0.60, respectively, which is different from the global CCs or individual CC defined by each cluster or by each node. Evidence suggests that in most real-world networks, nodes tend to create a tightly knit groups characterized by a relatively high density of ties; this likelihood tends to be higher than the average probability of a link randomly established between two nodes[15,29]. Scientific publication is one of the objective measurements to evaluate the achievements of a medical specialty or discipline. It is worth using SNA and Google Maps to explore knowledge to readers in the future. Many algorithms and measures (or indicators) have been developed in SNA to the graphical exploration of our data. If we investigate any author or paper most fits the research domain in a target journal, the centrality measures can be used. It means that the core subject can be analyzed using the centrality measure[11,24] yielded by SNA. The way we incorporated SNA with Google Maps is unique when compared with these published papers[9-11] merely using a single method of SNA. Another strength and feature of this study is that with Google Maps linked to the references[18-20], for interested readers, one can manipulate the link in their own ways on the Google dashboards. 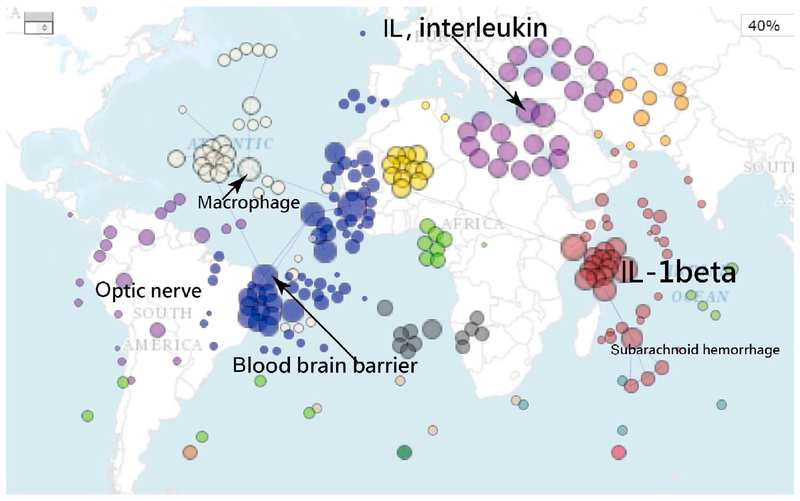 The national distribution in Figure 1 allow the reader to easily understand the feature of international author collaborations in neuroimmunology and neuroinflammation. One picture is worth ten thousand words. We hope following studies can report other kinds of information using Google API in the future. The interpretation and generalization of the conclusions of this research should be carried out with caution. First, the data from this study are from Medline for a single journal. It is worth noting that any attempt to generalize the findings of this study should be cautious in the fields of journal domains. Secondly, although the data were extracted from Medline and carefully dealt with during every linkage as correctly as possible, the original downloaded text file might have some errors in symbols such as period and comma in author address that may lead to some bias in the resulting nation distribution. Thirdly, there are many algorithms used for SNA. We merely applied separation components showing in figures. Any changes made along the algorithm will cause different pattern. Fourth, the social network analysis is not subject to the Pajeck software we used in this study. Others such as Ucinet and Gephi are suggested to readers for use in the future. In conclusion, social network analysis provides wide and deep insight into the relationships among nations in coauthor collaboration. The results can help readers in future submission to a journal in neuroimmunology and neuroinflammation. All data were downloaded from Medicine library and in Tables. 1. Kipnis J, Derecki NC, Yang C, Scrable H. Immunity and cognition: what do age-related dementia, HIV-dementia and 'chemo-brain' have in common? Trends Immunol 2008;29:455-63. 2. Gendelman HE. Neural immunity: friend or foe? J Neurovirol 2002;8:474-9. 3. Das Sarma J. Microglia-mediated neuroinflammation is an amplifier of virus-induced neuropathology. J Neurovirol 2014;20:122-36. 4. 't Hart BA, den Dunnen WF. Commentary on special issue: CNS diseases and the immune system. J Neuroimmune Pharmacol 2013;8:757-9. 5. Morris MA, Saboury B, Burkett B, Gao J, Siegel EL. Reinventing radiology: big data and the future of medical imaging. J Thorac Imaging 2018;33:4-16. 6. Domingos P. A few useful things to know about machine learning. Commun ACM 2012;55:78-87. 7. Verhoef PC, Kooge E, Walk N. Creating Value with Big Data Analytics: Making Smarter Marketing Decisions. London: Routledge; 2016. 8. Power DJ. What is the "true story" about data mining, beer and diapers? DSS News. Available from: https://goo.gl/1FtGft. [Last accessed on 26 Mar 201]. 9. Sadoughi F, Valinejadi A, Shirazi MS, Khademi R. Social network analysis of Iranian Researchers on Medical Parasitology: a 41 year co-authorship survey. Iran J Parasitol 2016;11:204-12. 10. Osareh F, Khademi R, Rostami MK, Shirazi MS. Co-authorship network structure analysis of Iranian researchers' scientific outputs from 1991 to 2013 based on the Social Science Citation Index (SSCI). Collnet J Scientometr Info Manag 2014;8:263-71. 11. Liu X, Bollen J, Nelson ML, Van de Sompel H. Co-authorship networks in the digital library research community. Inf Process Manag 2005;41:1462-80. 12. Dasgupta S, Vaughan AS, Kramer MR, Sanchez TH, Sullivan PS. Use of a Google Map tool embedded in an internet survey instrument: is it a valid and reliable alternative to Geocoded Address Data? JMIR Res Protoc 2014;3:e24. 13. Kobayashi S, Fujioka T, Tanaka Y, Inoue M, Niho Y, Miyoshi A. A geographical information system using the Google Map API for guidance to referral hospitals. J Med Syst 2010;34:1157-60. 14. Holland PW, Leinhardt S. Transitivity in structural models of small groups. Comparative Group Studies 1971;2:107-24. 15. de Nooy W, Mrvar A, Batagelj V. Exploratory Social Network Analysis with Pajek: Revised and Expanded, 2nd ed. New York, NY: Cambridge University Press; 2011. 16. Phan TG, Beare R, Chen J, Clissold B, Ly J, Singhal S, Ma H, Srikanth V. Googling service boundaries for endovascular clot retrieval hub hospitals in a Metropolitan setting: proof-of-concept study. Stroke 2017;48:1353-61. 17. Krackhardt D, Stern RN. Informal networks and organizational crises: An experimental simulation. Soc Psychol Q 1988;51:123-40. 18. Chien TW. Google Maps on the topic of author collaboration in neuroimmunology and neuroinflammation. Available from: http://www.healthup.org.tw/gps/Neuroimmunology.htm. [Last accessed on 26 Mar 20]. 19. Chien TW. Google Maps on eminent authors in neuroimmunology and neuroinflammation. Available from: http://www.healthup.org.tw/gps/ Neuroimmunologyauthor.htm. [Last accessed on 26 Mar 2018]. 20. Chien TW. Google Maps on MESH terms in neuroimmunology and neuroinflammation. Available from: http://www.healthup.org.tw/gps/Neuroimmunologykey.htm. [Last accessed on 26 Mar 18]. 21. Leydesdorff L, Wagner C, Park HW, Adams J. 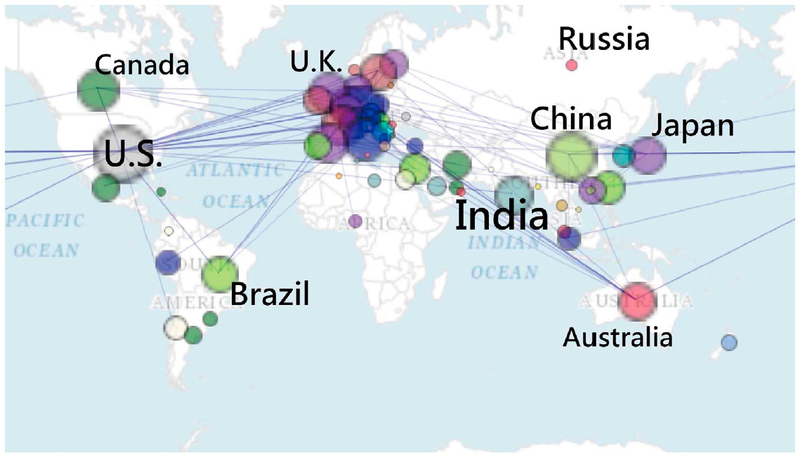 International collaboration in science: the global map and the network. Available from: https://arxiv.org/ftp/arxiv/papers/1301/1301.0801.pdf. [Last accessed on 26 Mar 2018]. 22. Glänzel W, Schlemmer B. National research profiles in a changing Europe (1983-2003): an exploratory study of sectoral characteristics in the Triple Helix. Scientometrics 2007;70:267-75. 23. Erfanmanesh MA, Rohani VA, Basirian Jahromi R, Gholamhosseinzadeh Z. Investigating scientific collaboration of Iranian Psychology and Psychiatry Researchers. J Info Process Manag 2013;29:137-63. 24. Osareh F, Norouzi Chakoli A, Keshvari M. Co-authorship of Iranian researchers in science, social science, art and humanities citation indexes in the web of science between 2000 and 2006. J Info Sci Technol 2010;25:573-95. 25. Hu SK, Huang J, Hong WD, Du XJ, Jin R, Lin TS. The 50 most-cited articles in gastroenterology and hepatology from Mainland China. Pak J Med Sci 2017;33:215-20. 26. Coelho DH, Edelmayer LW, Fenton JE. A century of citation classics in otolaryngology-head and neck surgery journals revisited. Laryngoscope 2014;124:1358-62. 27. Chien TW, Chang Y, Chow JC, Chou W. Patterns of international author collaboration in surgery. Austin J Surg 2017;4:1114. 28. Wang HY, Chien TW, Chow JC, Chou W. Applying clustering coefficient to the pattern of international author collaboration in anesthesiology. ARC J Anesthesiol 2017;2:18-24. 29. Watts DJ, Srogatz S. Collective dynamics of 'small-world' networks. Nature 1998;393:440-2. 30. Chang HT, Lin MH, Hwang IH, Chen TJ, Lin HC, Hou MC, Hwang SJ. Scientific publications in gastroenterology and hepatology in Taiwan: an analysis of Web of Science from 1993 to 2013. J Chin Med Assoc 2017;80:80-5. 31. Borgatti SP, Everett MG, Freeman LC. Ucinet for Windows: Software for Social Network Analysis. Harvard, MA: Analytic Technologies; 2002. 32. Bastian M, Heymann S, Jacomy M. Gephi: an open source software for exploring and manipulating networks. International AAAI Conference on Weblogs and Social Media; 2009.